From left: Owners' representative Michael Leong, AsiaMalls Management Pte Ltd GM Stephanie Ho, DTZ Nawawi Tie Leung Property Consultants senior director Adzman Shah and Pramerica director of portfolio management Bernard Loh at the press conference announcing the investment yesterday. PETALING JAYA: Pramerica Real Estate Investors (Asia) Pte Ltd, a real estate investment business of US-based Prudential Financial Inc, expects to invest some RM1.1 billion in four retail projects comprising four shopping malls in Malaysia through its Asian Retail Mall Fund (ARMF), its portfolio manager said. “We expect to put in a total development cost of RM1.1 billion for these four malls. We are still waiting for the evaluation of the malls’ gross development value (GDV) from evaluators,” Pramerica director of portfolio management Bernard Loh told a press conference here yesterday. ARMF is a real estate fund managed on behalf of institutional investors by Pramerica. It is also the owner of Kinta City in Ipoh, but it does not involve itself in the mall’s management. Three of the projects are under construction — SSTwo in Petaling Jaya, Ampang Mall in Jalan Ampang and 1st Avenue in Georgetown. The RM40 million refurbishment of Penang’s Island Plaza shopping mall, which was acquired in August last year for RM120 million will begin in the first quarter next year for a time period of 15 months. These four malls provide a total net lettable retail area of about 1.8 million square feet — 462,800 sq ft at SSTwo, 580,000 sq ft at Ampang Mall, 400,000 sq ft at 1st Avenue and 326,800 sq ft from Island Plaza. SSTwo was targeted for opening by next year-end, while the construction of 1st Avenue and the Phase 1 of Ampang Mall would be completed by the fourth quarter next year and the first quarter of 2011, respectively. In Singapore, ARMF has invested in seven shopping malls — Tiong Bahru Plaza, Century Square, Hougang Mall, White Sands, Liang Court, Jurong Point 2 and Tampines 1 as well as an office tower called Central Plaza. Its eighth mall, Serangoon Mall, would be completed in first quarter of 2011. AsiaMalls Management Pte Ltd is the leasing agent and retail mall manager for ARMF’s properties in Singapore. Loh said ARMF might acquire more malls in Malaysia, but the location would focus on developed areas in the Klang Valley and Penang. “The decision to invest in Malaysia was driven by the positive growth figures and consumer sentiment despite difficult global market conditions. The latest Malaysia Retail Industry Report placed the total retail expenditure of 2007 as nearly RM67.1 billion, 12.8% higher than the year before. “We also believe that other critical factors like increasing tourist arrivals and sustained domestic spending will provide higher revenues,” he added. When asked if the company planned to inject the properties into a real estate investment trust (REIT), Loh said there was such a possibility, but that would be subject to market conditions. In Malaysia, DTZ Nawawi Tie Leung Property Consultants Sdn Bhd will be Pramerica’s leasing agent and retail mall manager for the four malls. DTZ senior director Adzman Shah said demand for suburban malls was increasing despite the global financial crisis, as there were not many major malls opening in 2007. “For well-located malls, the average occupancy is between 80% and 90%. We talked to some retailers and they are quite excited about the projects. They know the market will be going very fast once it moves on,” Adzman added. Pramerica is the real estate investment arm of US company Prudential Financial Inc.
"We are keen to be part of an economy that remains competitive despite the current financial climate and Malaysia fits the profile," ARMF portfolio manager Bernard Loh told reporters at the launch of the properties yesterday. Two of the malls, Ampang and SStwo, will be located in the Klang Valley. A third, 1st Avenue, will be developed in George Town, Penang. The fourth, Island Plaza, is an existing mall in Penang that will be refurbished in the first quarter of next year. Pramerica has appointed property consultant DTZ Nawawi Tie Leung Property Consultants Sdn Bhd to be the leasing agent and retail mall manager. DTZ will be in charge of looking for tenants to fill up about 1.8 million sq ft in the four malls. DTZ senior director Adzman Shah said there still appears to be healthy demand for retail space in Malaysia despite the global economic slowdown. Retailers are gravitating towards well-run malls in good locations, especially in suburban areas, he added. "We have received a lot of inquiries and that is a good indication of where the market is going. Most of them know the market will move very fast once it picks up .... people are preparing for the next push," Adzman said. 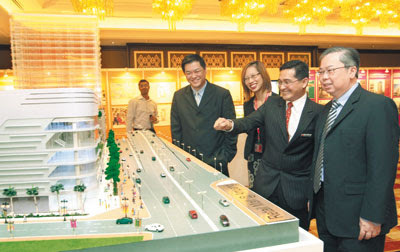 The Ampang mall, located along the upper end of Jalan Ampang, is to be completed by the first quarter of 2011. Its first phase will comprise a six-level retail podium. SStwo, built within the SS2 Petaling Jaya residential and commercial area, and 1st Avenue, situated along Penang's Magazine Road, are both expected to open by late 2009. SStwo is to be a five-level mall, while 1st Avenue - a joint venture between ARMF, Penang's Belleview Group and the Lion group - will have seven levels of retail space, including a dedicated youth level. "We are offering local, regional and international retailers a different and wider range of retail estate to establish their businesses," Loh said. ARMF has no plans to acquire more properties in Malaysia for now as its focus will be on the four malls, he said. On whether the malls would be injected into a real estate investment trust, Loh said it was a possibility that the fund would consider later. In Singapore, ARMF manages shopping malls such as Tiong Bahru Plaza, Century Square, Hougang Mall, White Sands, Liang Court and Tampines 1.